What’s the fuzz about antioxidants, you might wonder. People are talking about them everywhere around us. Product labels claim you should buy them, because they are packed with antioxidants. And don’t forget to feed your body with loads of fruits and veggies every day, because they are supposed to be full of them. But what are antioxidants really? What do they do? Should we make them a part of our daily diet? Antioxidants reduce damage to cells that is caused by oxidation. Hence the name: they are anti oxidation, so ‘antioxidants’. As an example, let’s take apples. Have you ever wondered why they turn brown almost immediately after you cut them? It’s because the fragile part of the fruit, the inside, is exposed to oxygen. 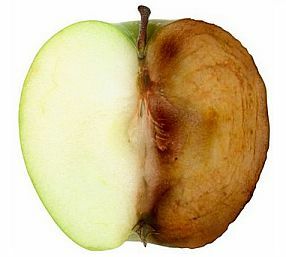 Oxidation happens and the fruit turns bad. Even rust is a result of oxidation. When cells are exposed to oxygen, they start to break down. This also happens in our bodies. Except we call it aging. Now everybody gets older, of course, but can we, by reducing the oxidation in our bodies to a minimum, slow down the process and grow old with younger skin, bodies and minds? Antioxidants are added to food, cosmetics and other products to reduce oxidation by oxygen and to preserve them. In Europe, you can find antioxidants as an ingredient on the ingredient label of products (E-number). The most familiar and studied antioxidants in foods are vitamins A, C, E, lycopene and beta carotene. Antioxidants are capable of neutralizing or stabilizing free radicals, which cause oxidation, before they damage cells. When there aren’t enough antioxidants in the body, the pro-oxidants and the antioxidants are out of balance. This is called oxidative stress. Free radicals can be formed when a cell is exposed to ionizing radiation* or toxins**. This may change or kill the cell, and then form a free radical. Free radicals can harm cells because they are highly reactive chemicals. We actually need them in small amounts, because free radicals play an important role in a lot of cellular processes that normally occur in our bodies. Therefore they are also formed by our own bodies, but only in small amounts. It is when we have high amounts of free radicals in our bodies when it starts to get dangerous. They can damage, for example, DNA and cell membranes. get why we don’t want too much of them running around our bodies. Our bodies do actually also produce antioxidants (endogenous antioxidants), but for them to be as active and efficient as they can be, they need certain micronutrients such as selenium, manganese, zinc, iron and copper to work with. If we don’t get enough of these trace minerals, our antioxidants simply don’t work as well. Also, the body doesn’t produce not as much antioxidants as it needs. Therefor we rely on external sources of antioxidants (exogenous antioxidants or dietary antioxidants) to neutralize as many free radicals as possible. Good sources of exogenous antioxidants are fruits and vegetables, but even more: tea (whether freshly made hot tea, overnight fridge tea or ready-to-go convenience tea). You can also buy antioxidants as dietary supplements. Don’t supplement before consulting a doctor! If you are diagnosed with any disease, such as cancer, and you want to take antioxidant supplements to help you fight the disease, please always consult your doctor. Trials in cancer patients have shown that taking antioxidant supplements can actually worsen the situation, says the National Cancer Institute. Also, keep in mind that supplements can interfere with any medication you’re taking. They may even cause side effects and/or trigger allergies. Taking supplements may not do your health any good per se. Besides that, regulations for any type of supplement are usually nowhere near those for medicines and little studies have been done to show that supplements actually help us. Any long term effects are still unknown. It is always best to get your antioxidants from real, fresh and unprocessed foods. You have to be extra careful when you are pregnant or breastfeeding. Can antioxidants keep us younger? So to come back to the question earlier in this post: can antioxidants keep us look and feel younger? In short: yes, because they prevent free radicals from damaging our cells. And over time, cell renewal naturally slows down more and more, which causes ‘aging’. Antioxidants speed up the renewing of cells, and therefore slows down overall aging and development of diseases related to aging. So keep on eating those antioxidant packed foods and eat enough of them! Do you take in antioxidants on a daily basis? What is your preferred source for antioxidants? Share it with us in the comments below. *Ionizing radiation may for example be X-rays, radioactive substances of rays from outer space that reach the earth. ** Toxins could for example be high-oxygen atmospheres, cigarette smoke or certain metals. News Medical, What are Antioxidants?